Kifaru follows three dedicated rangers in Kenya's Ol Pejeta Conservancy tasked with one very important job: caring for Sudan, the world's last male northern white rhino. Without constant protection, Sudan and the other rhinos at the conservancy would be immediately hunted by poachers. As Sudan's health declines, the rangers must confront the grim reality of what his death will mean not only for themselves and the animal they have grown to love but for society and the world as a whole. Kifaru explores the challenges of the wildlife conservation crisis and offers a compelling real-life look into what extinction means not only on a global level but on a personal one as well. 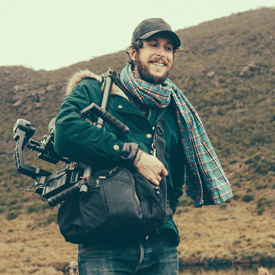 David Hambridge is an Emmy®-nominated cinematographer and award-winning commercial and documentary filmmaker based in the U.S. His interest lies in personal, truthful, and highly intimate storytelling. His approach relies heavily on the mutual trust between filmmaker and characters, focusing on the universal truths we all share as humans which can transcend cultural barriers and identify with audiences around the world. Kifaru is David's first feature-length documentary film as director. He is supported by Southern Documentary Fund, a non-profit banner of film industry professionals championing filmmakers across the American South to tell stories of local and global impact.